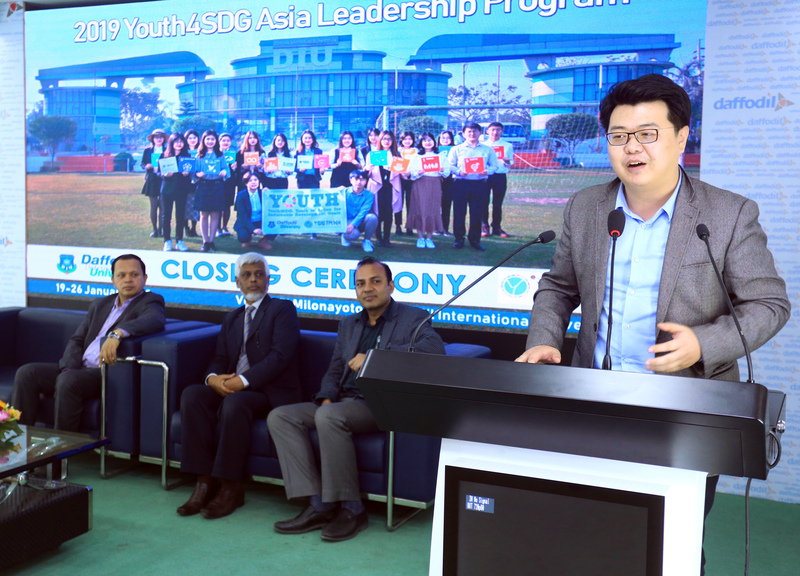 Mr. Alex Wang, Secretary-General, Youthink Center, China addressing at the closing ceremony of the “Youth4SDG Asia Leadership Program 2019 “in Bangladesh organized by Youthink Center China and Daffodil International University. Daffodil International University (DIU) hosted “Youth4SDG Asia Leadership Program 2019 “in Bangladesh organized by Youthink Center China with active participation of 18 talented students from 18 different universities in China. Under this program, the young leaders worked to create the social business plan after surveying different villages of Bangladesh under case study. They also visited the small enterprises, social business project, and had sessions on Social Business model Canvas etc. The program was held from 19 to 26 January 2019. Dr. Md. Sabur Khan, Chairman, Board of Trustees, Daffodil International University conducted a session on ‘Social Entrepreneurship in Mind’ followed by certificate awarding for the participants at the closing ceremony After 1 week long Social Business Action Learning, all the participants under 3 teams presented their Social Business project targeting different Sustainable Development Goals(SDGs). Mr. Alex Wang, Secretary-General, Youthink Center, China & Prof Dr. Md Masum Iqbal Dean of FBE and Director of YSBC DIU signed a Memorandum of Understanding to organize similar program every year and share each other’s resources in near future focusing on Sustainable Development Goal (SDG).